Natural color, 100% cotton brim hat.LIFEGUARD embroidered. Ideal for outdoor use. Base sizing on regular shirt sizing. A distinctive NEW look available now! Recommended for indoor use these singlets are yellow polyester with red side panels. LIFEGUARD OR LIFEGUARD/SAUVETEUR lettered on front and back in red and the Lifesaving Society round bilingual logo on back shoulder in white. Available in XS-S-M-L-XL-XXL Our new line of Lifeguard uniforms gives guards a professional and distinctive image - a look that stands out in a crowd. Instant credibility. Readily identifiable at a distance. Designed for lifeguards by the lifeguarding experts. Durable, lightweight, UV protection, superior comfort and fit and Internationally recognized colors of yellow and red. A distinctive NEW look available now! Recommended for indoor use these singlets are yellow polyester with red side panels. LIFEGUARD OR LIFEGUARD/SAUVETEUR lettered on front and back in red and the Lifesaving Society round bilingual logo on back shoulder in white. Available in S-M-L-XL-XXL-3XL. Our new line of Lifeguard uniforms gives guards a professional and distinctive image - a look that stands out in a crowd. Instant credibility. Readily identifiable at a distance. Designed for lifeguards by the lifeguarding experts. Durable, lightweight, UV protection, superior comfort and fit and Internationally recognized colors of yellow and red. Available in English or Bilingual. "LIFEGUARD" OR "LIFEGUARD/SAUVETEUR"
Base sizing on regular T shirt sizes. NEW Long sleeve Lifeguard Shirts with ribbed collar, ideal for outdoor pools and beaches. Superior sun protection provided by the long sleeves and a two button ribbed collar that can cover your neck. Unisex sizes of XS-S-M-L-XL-2XL. 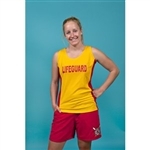 Our new line of Lifeguard uniforms gives guards a professional and distinctive image - a look that stands out in a crowd. Instant credibility. Readily identifiable at a distance. Designed for lifeguards by the lifeguarding experts. Durable, lightweight, UV protection, superior comfort and fit and Internationally recognized colors of yellow and red..